The catacombs can only be visited as part of a public guided tour. A cathedral guide will lead you through the tombs of bishops and royals and will show you the eerie cemetery under the cathedral square with all its bones. The time of the next tour can be seen on the timetable at the entrance to the catacombs. Please note that for liturgical or organisational reasons, guided tours may not take place, for which we ask your understanding in advance. The guided tour takes place every half hour when it is raining, see table at the entrance of the catacombs. 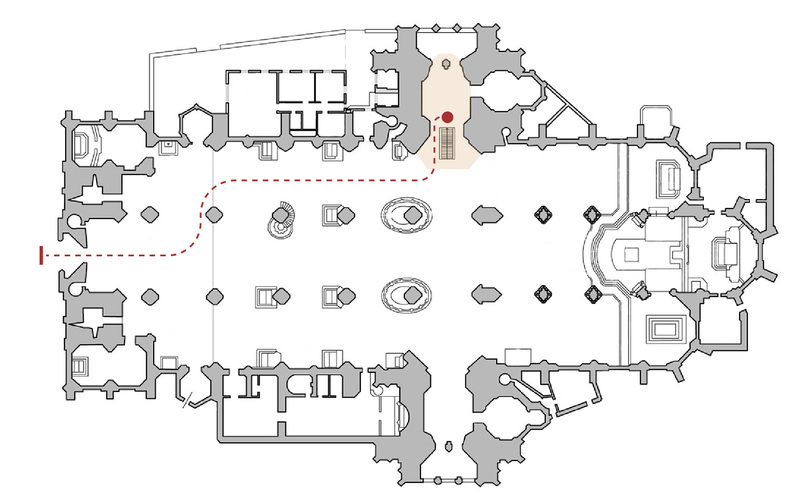 The red dot indicates the meeting place for a tour of the catacombs with a cathedral guide. You will be picked up from there at the start of each tour.